The band can offer an instrument on loan to anyone from the age of 6 upwards (no upper age limit!) who would like to learn how to play an instrument, how to read music, and wants to improve their playing and progress within the band. We meet at the Wortham Hall, Mount Kelly College, Tavistock. Our Musical Director is Peter Jones. Rehearsals take place in term time between 6pm and 7.15pm on Wednesday evenings. When possible we continue outside of term times. Beginners are encouraged to gain confidence before progressing into the training section of the band. As soon as beginners have learned the basic skills of playing the C major scale and can sight-read simple pieces of music they are able to join the training band. This gives them the opportunity to play their parts in a group of musicians, to improve their playing and increase their confidence. Regular attendance at rehearsals is necessary. Some practise time at home is also required. Players who have an instrument on loan from the band are expected to clean and take care of it. Instruments, sheet music and uniform items remain the property of the band and should be returned if a member leaves. Training band is conducted by Charles and Maddy. Adult players give assistance and are DBS checked and are aware of the band’s child protection policy. Judi is the officer who deals with any concerns. Performances take place from time to time. Our training band has played at Mary Tavy Fair in May for the past two years and has played carols in St. Eustachius Church, Tavistock before the main band’s concert. We have helped young people to achieve qualifications such as their Duke of Edinburgh awards by enabling them to mentor players in the training band or gain some experience in conducting. 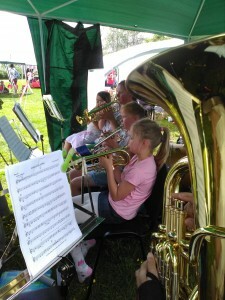 Young players are encouraged to join the Devon Youth Brass Band and further their musical education. Stannary Brass Band is a public learning destination for The Children’s University. Whenever a training band member feels they are ready, they are welcome to sit in with the main band to learn to follow the music and play whatever they are able to. Just tell Charles, Maddy or Peter when you feel ready to do this. Peter will tell you when he thinks you are ready to join the main band permanently. Graeme – lower section main band. The training band has a representative who reports to the committee: this is Zach, who also helps to apply for youth grants. In-house workshops are held from time to time. Members who attended the 2015 SWBBA workshop were asked to pass on 3 top tips to their bands. They are: POSTURE, PREPARATION and PRACTISE. Attention to these three will improve our playing.